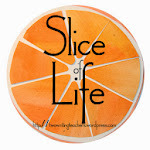 #IMWAYR is one of my favorite days to check blog posts. 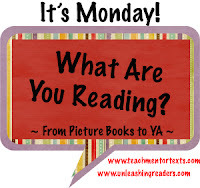 It is so fun to see what everyone is reading! 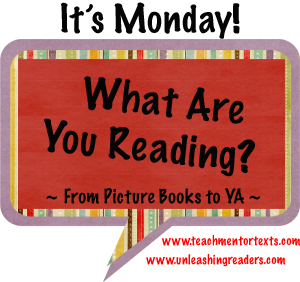 Thanks to Jen Vincent for hosting the kidlit version of this at her blog, Teach Mentor Texts!! It's been a few weeks since I've posted my reading, so it's fun to see that one book I loved, Bill did too - Echo by Pam Munoz Ryan. Some of the other books that I read the past weeks and entered in GoodReads are shown below. Crenshaw by Katherine Applegate - This was a generous gift received at #nerdcampMI last week and it did not disappoint. An imaginary friend that stays with you when he/she is needed - so many children will relate to this. It seems that I've read several books on homelessness and this would be another one to add to that list. With all the great books out there on this topic, a unit on empathy could add Crenshaw as a must read. Echo by Pam Munoz Ryan - This was my read after Crenshaw and since I loved that story so much, I didn't think any book could measure up. Boy, was I wrong! Three separate story lines, intertwined by the same musical element, and cliffhangers after each section that left me needing more - all of these combine in a story that children will love. Blizzard by John Rocco - A wonderful picture book that many have already read, but I just got to it this summer. I still liked Blackout better, but I really enjoyed the community service displayed in this book. And the winter of "the blizzard" was my first year to live on my own as an adult after college - many of the scenarios in this book felt very familiar! The Terrible Two by Mac Barnett - This was a fun story of two boys who both labeled themselves master pranksters. It was only natural that a "prank war" would ensue. Lots of trouble and fun, all at once. The best is what happens when two pranksters combine their efforts toward a common goal! The Island of Dr. Libris - An island where a very imaginative boy can make characters from stories appear - that is the premise of this story, but it gets a little complicated when characters from different stories start to engage with one another. I enjoyed the literary elements built into this story, and I really liked the message of how much more creative children are than adults. Book Scavenger by Jennifer Chambliss Bertman - Another story with a literary backdrop, but I liked this one even better!!!! This was recently recommended to me, and was a great find! Ciphers, friendships, trying to fit in, bad guys, playing a game that no one else (except the bad guys) know about, family relationships - this book has it all. I love the shout out to Edgar Allen Poe in this book, but I especially liked the different books the main character, Emily, leaves in different parts of the city for others to find using a site for Book Scavenger players and giving online clues - Escape from Mr. Limoncello's Library and The Westing Game, just to name a few. I think students will really enjoy this, though I also think many of them may miss out on some of the Poe literary references. Paper Things by Jennifer Richard Jacobson - I loved this book as much as I loved her other book, Small as an Elephant. This is a beautiful story that focuses on unique family units as well as homelessness (another book to help promote empathy). I had a great few weeks of reading! I'm looking forward to even more great books in the next weeks. Crenshaw is coming up on my review stack. I can't wait to get to it since I have heard such marvelous things about it. I really liked Book Scavenger too. Did you know there's a website and you can really play? Here is my report for the week. Happy reading! I didn't realize til reading your post that Paper Things is by the same author as Small as an Elephant. I have had Paper Things on my to-read list, but will definitely move it up after learning this! Small as an Elephant is such a lovely, poignant story.